A new stainless steel Rotary Knife Cutter, Model #4-SS, from Munson Machinery cuts corn, spices, roots, grains and other foods into controlled sizes gently, sharply and accurately, with little or no fines or dust. The unit features a rotor assembly with five full-length knives that cut material against four stationary bed knives until particles become small enough to pass through apertures in two large, semi-cylindrical screens. For more information, see Munson Machinery. The new Meyer W.E.A.R. valve is engineered for problem applications with abrasive material build-up. A heavy chrome, diamond chrome, ceramic or chrome carbide coating is used on the valve internals according to the material conveyed. The valve includes a closed-end type rotor, typically hard faced on all tip contact areas with Stellite and precision ground. Read more about the Meyer W.E.A.R. valve here. Sly, Inc has partnered withEagle Environmental, Inca to become the "one stop shop" for everything dust collectors. In addition to parts and filters for all brands of baghouses, they provide a full line of maintenance and change-out services. 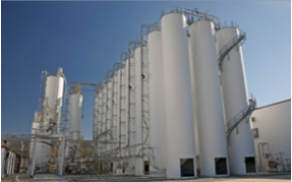 Tank Connection introducesAQUA AGT 2020â„¢,a proprietary glass coating system consisting of a new formulation and a two coat, two fire process. This glass/vitreous enamel is one more bolted tank coating option available for municipal and water storage applications. For more information, visit AQUA AGT 2020â„¢. Munson Machinery introduces aCentrifugal Impact Mill (Pin Mill).Grind friable materials, reduce flakes and de-lump agglomerates into narrow particle szie ranges without the use of screens. For more information, visit CIM/Pin Mills. Meyer introduces "SolidFit" an interactive valve sizing program. Create a "new project", enter your application information and "SolidFit" will generate a list of Meyer valve solutions. For more information, visit SolidFit. The NEW Ribbon Blender by Munson Machinery blends up to 65 cu ft (1.84 m3) of powders, pastes or slurries. Model HD-3.5-7-S316 is constructed of #316 stainless steel with continuous welds having 0.25 in. (6 mm) radii polished to 150 grit, a #4 (-32 Ra) interior surface finish and external removable seals. Available sizes range in capacity from 1 to 1000 cu ft (.03 to 28 m3). For more information, visit Munson Machinery. SEPARATE SOLIDS FROM WASTE STREAMS WITHOUT CLOGGING! Munson Machinery's Rotary Drum Screen, removes solids from industrial and municipal waste streams and recovers solid product from process streams without blinding or clogging the stream. The compact design, 24"x72", reduces floor space and headroom requirements. For more information, visit Munson Machinery. Lorenz introduces the Automated Inline Angle Hair Trap, which eliminates the need to shut down your line while removing angel hair from your plastics lines. Suitable for pressure and vacuum systems. For more information, visit Lorenz here. For a chance to win, submit photos of Sly wet scrubbers, cartridge collectors, baghouses or wet scrubbers to parts@slyinc.com, along with a signed release form. Send multiple photos to increase your chances of winning. Winning photos may be used on the Sly website or in their marketing materials. TEC Engineering has partnered with Intersystems to provide automatic product sampling systems for pneumatic and mechanical conveying applications. You may visit Intersystems here. In early May, TEC Engineers attended PTXi, the International Powder & Bulk Solids Conference in Chicago. The technical training event showcases the latest innovations and best practices in dry processing, bulk material handling and storage. Sly, Inc., a manufacturer of air pollution equipment, adds wet filters to its aftermarket product line. The wet filters are engineered to meet or exceed OEM specifications. They are available in a variety of sizes and media for industrial applications. Kent Irwin retired on December 31, 2013, after 33 years with the company he cofounded. We wish Kent the best in the years ahead as he pursues his interests. Steven Duke assumes Kent's responsibilities in the Birmingham, AL office. Sly, Inc.'s wet filtration filters are available in a variety of sizes and all available media for industrial applications. Sly wet filters meet or exceed OEM specifications. Meyer introduces the Klean-In-Place II® Rotary Airlock Feeder. This special purpose valve is ideally suited for applications requiring frequent cleaning to prevent product contamination. Read about it here. The TEC Atlanta office has relocated. Our new address is 140 Wedgewood Falls Dr, Canton, GA 30114. The phone and fax numbers remain the same: 770-517-1350 (ph); 770-517-2396 (fax). Munson Machinery introduces a high temperature, high intensity continuous blender, providing a solution for products requiring high heat to maintain consistency. Read about it here. Horizon Systems,a manufacturer of food industry products, publishes a white paper on food safety. Read the white paper here. The Atlanta, GA office of TEC Engineer now represents Carman Industries. Carman designs and manufactures vibratory material handling and processing equipment. TEC's Birmingham, Covington and Mobile offices have represented Carman for more than 20 years. For more information on Carman products, contact us or visit Read about it here. Tecnetics Industries designs and manufactures in-motion weighing and metering products for dry material handling applications in the mining, construction aggregates, food, chemical and plastics industries. Marketed under the Tecweigh brand name, products include belt scales, volumetric and gravimetric feeders, weigh belt feeders, control gates and custom engineered systems. The address for their new manufacturing facility is: 1201 N Birch Lake Boulevard, St. Paul, MN 55110. For more information on Tecweigh products, contact us or visit Tecweigh. Kent Irwin, Bob Jeremias, Bob Hodges, Steven Duke, Lance Steed and Harvey Kinsey from TEC Engineering all attended the International Powder & Bulk Solids Conference and Exhibition in Chicago May 8-10. The event showcases cutting edge technology for processing engineers, production engineers, plant managers and operations managers who process, handle, package, transport, test and store dry particulates and bulk solids. Wm. W. Meyer & Sons, a leading manufacturer of dry bulk material processing equipment, pneumatic conveyors and dust collector systems announced Tim Szostak as their new National Sales Manager for their Process System Components Division. For more information on Meyer products, contact us or visit Meyer. Kent Irwin, Bob Jeremias, Steven Duke and Harvey Kinsey from TEC Engineering attended the Powder Show in Atlanta, GA, March 13-15. Over one hundred suppliers of cutting edge powder processing and handling equipment products and innovations were on display, including those by Tank Connection and Horizon Systems. Other manufacturers we represent who were in attendance were DCL, Lorenz, Meyer and IMI. Sly is now offering a new style of core-less pleated bag. Manufactured by GE, the Sim-Pleat bag is a lower cost pleated bag, appropriate for most Sly applications at standard pressure and temperatures to 180 F. It cannot be used for filter receivers or high pressure applications. For high temperatures and pressures Sly continues to recommend standard pleated bags with internal cores. For more information, contact us or visit Sly. Smico Manufacturing relocates headquarters to Oklahoma City, where they acquired another 43,000 sq ft of production space. The new facility also allows for expansion of their screeners, feeders and vibratory conveyor lines, as well as room for a High Def Plasma cutter with one of the larger tables in the industry, measuring 15 ft wide by 45 ft long. Visit Smico. We continue to grow in 2012, adding Horizon Systems, an industry leader, to our line of manufacturers. Horizon Systems is both an engineering and a manufacturing company. They specialize in pneumatic conveying and material handling, as well as providing process solutions and system integration for the plastic, chemical, mineral, food and pet food industries. Visit Horizon Systems website here, or contact your TEC representative for more details. DCL has a new president -- Tim English. Congratulations, Tim! 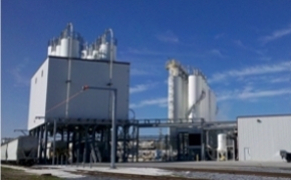 DCL, provides dust control and loading systems for the food, chemical, mineral and energy industries. Congratulations to Greg Buric, who assumes the role of President for Meyer & Sons. Meyer, is a world leader in the manufacture of dry bulk material processing equipment. Congratulations to Dennis O'Leary, the new General Manager at Industrial Magnetics. IMI, is an industry leader providing both permanent magnets and electromagnets for work holding, lifting, fixturing, conveying and magnetic separation. Headquartered in Boyne City, MI, they celebrate their 50th anniversary this year. Bill Kurtz of Sly, Inc. describes in-plant applications for dust collectors and the typical industries relying on dust collectors and baghouses. The three-part lecture series covers the application criteria for the types and modes of dust collection systems, and the advantages and disadvantages of each. In addition to the "three c's" of dust collection: capturing, conveying and collecting, you'll learn particulate collection theory and how to properly size and select a dust collector. For more information, visit Powder and Bulk here. Beginning November 1, 2010, American Fan Company will begin powder coating fans. The high quality, durable polyester/chemical resistant finish is offered as a standard feature. Green is the standard color with black or off-white options available at no additional cost. Static Presures up to 26"
Effective September 13, 2010, Wm. W. Meyer & Sons, Inc. discontinued the HDT Series of Rotary Valves. In their place, UDV or HDX series valves are recommended, as warranted by the application.